Policy decisions regarding land use and land management are increasingly accounting for non-consumptive uses and ecosystem services. 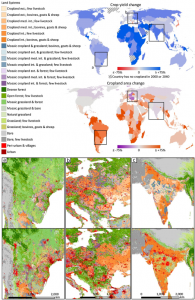 This research presents three global land change scenarios from 2000 to 2040: a reference scenario, a no net loss of terrestrial carbon scenario, and a biodiversity protection scenario. All scenarios contain demands for tons of crop production, number of ruminant livestock, and built-up area. The carbon scenario contains a fourth demand for terrestrial carbon and is applied such that no net loss of carbon can occur in any of the model regions. The biodiversity protection scenario contains a fourth demand for potentially protected area. The data made available for download here are year 2000 (the same for all scenarios), and year 2040 maps for each scenario, as well as a symbology file for visualization in ArcGIS, and a color coded legend spreadsheet. For more information about these data and the analyses please refer to Eitelberg, D.A., van Vliet, J., Doelman, J.C., Stehfest, E., Verburg, P.H., 2016. Demand for biodiversity protection and carbon storage as drivers of global land change scenarios. Glob. Environ. Chang. 40, 101–111.